The first time I found out that Taiwan had once been colonised by the Dutch was back in the early eighties, when I joined my parents there for a gap year. At the time I must have known that the VOC (Dutch East India Company) had once had settlements in Japan, Sri Lanka, India, South Africa, and Indonesia, but I had absolutely no idea that the island had ever been under Dutch rule. Yet the Dutch occupied seventeenth-century Taiwan for nearly forty years, until they were finally expelled by the Chinese warlord Koxinga (Zheng Chenggong), who was the son of a notorious Chinese pirate and a Japanese woman of the Samurai class. Even in Holland, this chapter in our colonial history is quite unknown. Not surprisingly perhaps, considering the VOC lost the island in a rather embarrassing manner: through neglect and by not heeding the many warnings it was given. The loss of the lucrative colony cost them a fortune, and it was a painful episode which they felt was best forgotten. A few years after I left Taiwan, I wrote my dissertation on the subject while doing a degree in Chinese Studies at Durham University (UK). With my Dutch background, and the time I had spent in Taiwan, the choice seemed only logical, as the story intrigued me. I discovered that the story was fairly well documented in Taiwan, China, and even Japan, with the focus very much on Koxinga, while that of the Dutch colonists was sadly lacking. Hardly anything was known about them. After thoroughly researching both sides of the story I saw its potential, and I vowed that, if ever given the time, I would turn it into a novel. As things go, jobs got in the way, as did motherhood (I have two young adults still living at home now) and a couple of international moves as a family. Twenty years after handing in my academic dissertation, we moved to Dubai, where I found I had a lot more time on my hands, and this is when I started writing. The bulk of the research had, of course, been done, but I didn’t have much information on the personal lives of the leading Dutch characters. Had they been married, and to whom? Did they have children? Did they suffer personal losses? With the coming of the internet and the explosion of information that came with it, I suddenly had access to genealogical sites, city archives and other new sources which provided me with such invaluable material. That gave me more insight into their lives and enabled me to give the characters more flavour and depth. This also supplied me with the means to balance the story of the Dutch and Koxinga more evenly. Often, I am asked why, with all the research I had done, I chose to write the book in novel form, instead of non-fiction. I usually answer by saying that it is a spectacular tale that is so filled with human drama that I felt it deserved a bigger audience. It is not just a story of war, but one of men and women caught in the violent transition from one dynasty to another, of people who had to make heart-breaking decisions for which they paid a great personal price. But the one thing that really appealed to me about the story is the way the destinies of Koxinga and Dutch Formosa seem to be so inevitably linked (I won’t tell you how and why, for fear of giving away too much). That, and the fact that many sources suggested that some kind of prophecy had been made during Koxinga’s youth, part of which claimed that Formosa would one day be his to rule, which he believed. Writers of non-fiction would skirt around something like that with trepidation, whereas it is fine to explore it in a novel. The prophecy is one of the threads running through the book. 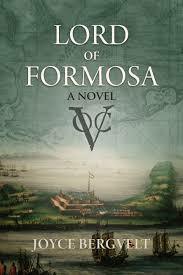 Details: Lord of Formosa is published by Camphor Press in hardback, paperback, and eBook. Priced in local currencies.